Lisa, of course, was one third of the hit-making hip-hop/R&B trio m-flo. 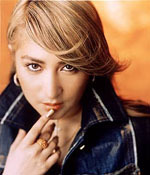 Her sweet voice and bilingual ease made her distinct among other chart-topping singers in Japan. Lisa was already working to break into music when she started jamming with Verbal and Taku. According to Verbal in an interview with Metropolis, Lisa would jump in during performances and would hang out at Taku's house, contributing melodies to Taku's instrumental tracks. Lisa started branching out on her own in 2001, first on a duet single with rock band Triceratops, then later with her own single. She announced her departure from m-flo in April 2002. In the year since she left m-flo, Lisa has released three more singles, and her debut solo album, Juicy Music, was released in April 2003. She followed the album a year later with Gratitude.